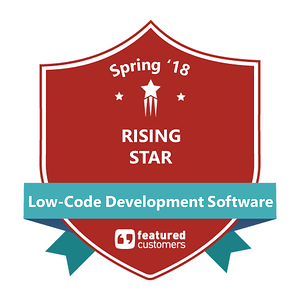 Alpha Software has been named a Rising Star in the Low-Code Development Software category for the Spring 2018 Customer Success Report published by FeaturedCustomers. FeaturedCustomers is the leading customer success content marketing platform for B2B business software & services helping potential B2B buyers make informed purchasing decisions through vendor validated customer success content such as customer testimonials, success stories, case studies, and customer videos. FeaturedCustomers evaluated all the potential Low-Code Development Software companies on its platform for possible inclusion in the report. Only 12 companies meet the criteria needed for being included in the Spring 2018 Low-Code Development Software Customer Success Report. Alpha Software received an overall score of 85 earning a Rising Star award in the category. The Customer Success Report is based on the curation of authenticated case studies, testimonials, and reviews from across the web, telling a complete story of vendors in the Low-Code Development Software space through real customer experiences. Scores are determined by multiple factors including number of total reviews, customer success content, social media presence, and vendor momentum based on web traffic and search trends. Highly rated by customers, Alpha Software consistently publishes high quality vendor produced customer success content and curate’s quality customer reviews from multiple third-party sites. The full report, along with Alpha Software’s profile, which includes detailed product scorecards is available to download. Alpha Anywhere is one of the most highly rated low code development tools. In addition to FeaturedCustomers recent news, InfoWorld named Alpha Anywhere Technology of the Year and enterprises give it a perfect score on Gartner Peer Insights. Learn how Alpha Anywhere low-code development can help you organization, or read more recent articles on the rise of low-code app development. What is the Solution to Retaining Deskless Workers? Want to Speed Up Digital Transformation? Have Frontline Employees Lead the Way.